Last week Mary posted about the podcast Books on the Nightstand and the summer reading event they are running called Book Blanket Bingo. I immediately decided to participate – there’s nothing like a little competition (even if it’s only with myself) to motivate me to read more. I printed out a card – following their suggestion that I only hit refresh once – and I was able to check off two items right away since any books finished after Memorial Day counted and I read quite a bit on my staycation last week. So I checked off “cozy” mystery (Killer Librarian, it was cute) and nonfiction (Unbroken, also very good). Sadly, those two boxes are not connected but that’s okay because I’m going for a cover-all! But then. Then! I had a brilliant idea. I decided to use this concept to create an adult summer reading program at my library. 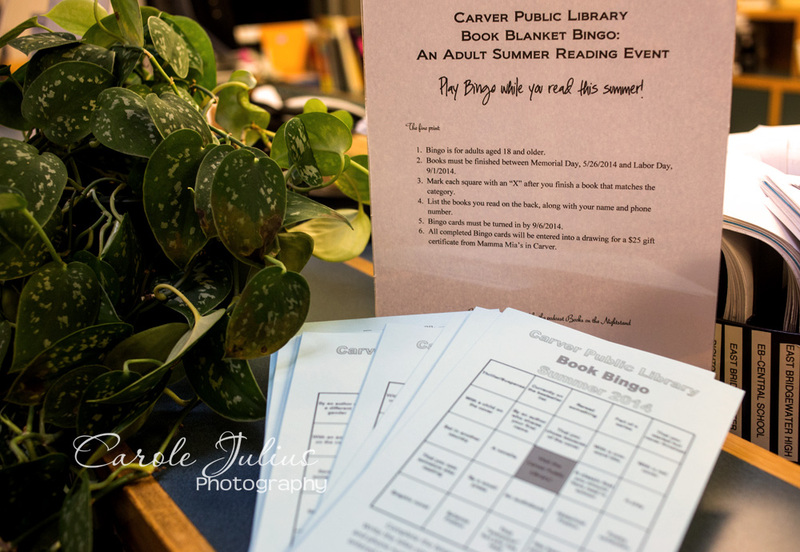 With the support of my Reference Librarian and the technical skills of my Children’s Librarian we had bingo cards available at the circulation desk by yesterday afternoon. They are also available for download on our Facebook page and we’re hoping for good participation from our adult readers. As an incentive, everyone who connects 5 squares and gets Bingo is going to be entered into a drawing for a $25 gift certificate to a local restaurant. So, thank you, Mary! And thank you Books on the Nightstand! You have inspired this librarian! that’s fantastic! and note that you are the only librarian I know; I’m going to use one of your recent recommendations (haven’t decided which one yet) to mark that square off my card. You’re a great librarian! That’s a wonderful idea. I thought about a cover all, but I’m not sure there is an author with my first name that would be worth the time to read! What a great idea. I remember being severely disappointed when I was no longer able to participate in the summer reading program. Can you tell I was a bookworm? That is wonderful! You’ll have to give us an update at the end of the summer. You are so innovative! What a wonderful idea. I am sure you will get lots of participation. What a cute idea! Summer reading is the best! What an awesome idea for your library!! !